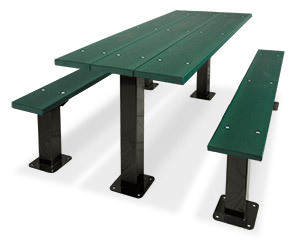 Create inviting spaces for patrons to eat, study or relax with 6', 8' or ADA recycled plastic rectangular multi-pedestal picnic tables. Seat and table top surfaces are eco-friendly recycled plastic planks reinforced with internal 1" flat steel strips that provide added structural integrity to maintain the original form throughout the years. Conveniently crafted with a detached, non-trip walk through frame design for hassle free access, strong multi-pedestal frames are constructed with highly supportive, 4" square steel powder-coated posts. Combining the naturally resilient, low maintenance characteristics of recycled plastic with the durability of commercial grade steel, multi-pedestal tables are a popular choice for college campuses, homeowner associations, apartment complexes and public parks.